Public schools are facing huge challenges when it comes to feeding their students. Budget constrains and the logistical nightmare of getting hundreds of students served in very short lunch periods make schools move toward For-Profit Food Service Companies to handle the cafeterias. Public schools have the option to participate in the Federal Lunch Program, which comes with nutritional and portion requirements but also with a nice reimbursement check in addition to what students pay for the meal. Tax dollars are reimbursing the Food Service Company for each meal, partially or entirely, currently at $3.25 per lunch, and $1.75 per breakfast. Any purchase price paid by the student, also goes to the food service provider. So, food service company bid on the school food contracts with an eye on who has a student population that will have the least free or reduced lunches and might even spend money on snacks. Food service companies are actually paying the school district for the privilege of feeding their students. Capitalism injected into public education. The National School Lunch Program championed by former First Lady Michelle Obama created a set of nutritional guidelines to ensure that food service companies are actually providing quality food for the tax dollars they receive. Minimum amounts per food group were established to make sure, students were not given only starchy (cheap) components. Guidelines on minimum protein and fruit portions as part of the menu assure that chicken nuggets actually contain meat and that fruit is not always the canned variety. All in an effort to feed children as balanced as possible, with wholesome ingredients. Feeding hundreds of children in a short time is very challenging and complying with all Federal Lunch Program Nutritional Guidelines is only adding to that challenge. And all of that, while trying to make a buck. Thus Food service providers are turning more and more toward pre-packaging of components to allow for a fast grab and go, while controlling portion sizes closely. Minimum requirements and not an ounce more. We Future Cycle deals with the management of the fall out of this pre-packaging craze. The cost of packaging alone, without the food cost is staggering and it does not even take the garbage disposal cost into consideration. That cost gets entirely dumped onto the school district. 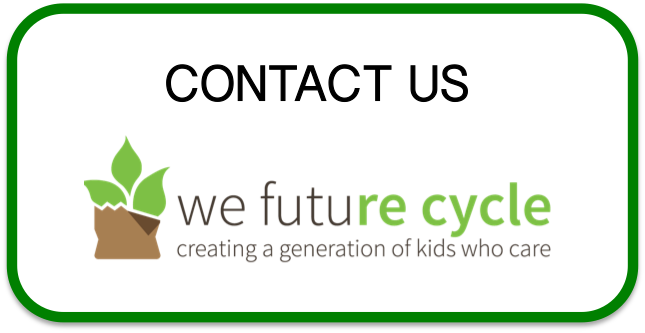 We Future Cycle studied the flow of food service, the time spent to pre-cup and is helping schools to cut down on pre-packaging with only very slight adjustments to their system. It has cut down the labor and material costs tremendously, and made it much easier to sort the materials in the lunchroom. Keep in mind, every penny spent on packaging is a penny less spent on quality food for our children. This picture shows a completely pre-packaged lunch, two slices of plastic wrapped bread one 4 oz cup with lid containing 3 leaves of lettuce, 3 single serve pouches of dressing and ketchup, and a molded 3 compartment hot tray, with plastic covering that contained 4 oz of meat, and 2 oz of cooked vegetable. This was served on a Styrofoam tray with a pre-packaged fork, napkin, straw combo and an 8 oz carton of milk. The packaging waste is staggering. There are better ways to spend tax dollars and feed out children.